Trouts are the first fish for most of the anglers.Trouts fish have variety species, for example rainbow trouts, Golden trouts,brook trouts and brown trouts. They like to stay in widely introduced into suitable freshwater environments throughout north America. The habitat is to stay in cold water rivers and lakes. 2.Why does trouts fly fishing is so attractive? 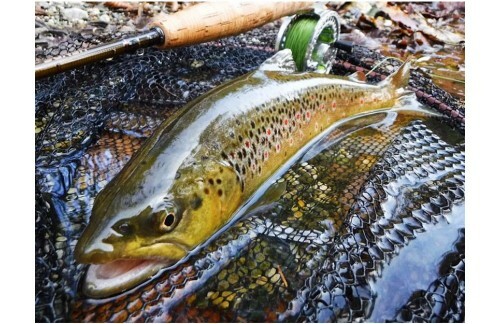 The game status is excellent and one of the best.Some trouts are heavy and it’s so hard to fight with.But fishing anglers like to overcome the difficulty in trouts fly fishing.They are strong,dogged fighters, often leaping in an effort to gain their freedom. 3. How to do better in trouts fly fishing? They are almost the perfect sportfish, they will hit lures,flies and baits,Trolling various spoons,plugs, spinners,near the surface and down deep with downriggers is successful on lakes. Fishing dry flies, streamers and wet flies or lures and soft plastics in rivers and lakes are all productive.